Field studies of animals help scientists understand the complexities and causes of animal behavior. Wild animals interact with their physical surroundings and the biological world while breeding, eating, and moving within their habitat. Although some behavioral studies are conducted in laboratories or zoos, many of the behaviors that animals exhibit in the wild are closely interconnected with the plants and animals around them and can only be observed during field studies. Charles Darwin, an English naturalist, presented his theory of evolution by natural selection in 1859, after observing the correlation between beak sizes and feeding behavior of ground finches in the Galapagos Islands. This theory has helped to shape a conceptual framework for modern biology. 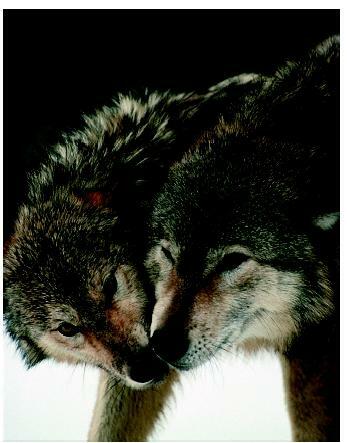 Gray wolves ( Canis lupis ) exhibiting submissive behavior. Studies of animal behavior seek the causes of behavior, how it has evolved over time, and how it contributes to a species' survival. such as ducks, geese, gulls, butterflies, fish, wasps, and bees, led to studies of animal behavior becoming more organized and systematic in seeking the causes of instinctive behavior, how it has evolved over time, and how it contributes to a species' survival. Lorenz and Tinbergen used little more than binoculars and a notebook for documenting careful and detailed descriptions of animal behaviors. Today, modern technology also plays a role in studies of animal behavior. For example, radio telemetry is used to track the movements and behavior of various animals from reptiles and amphibians to large mammals, satellite telemetry is used to document bird and sea turtle migration routes, and depth recorders are placed on diving seals and whales. Field investigations address many different types of behavior, including social behavior, mating systems, sheltering and feeding habits, predator-prey relationships, migration, and navigation. Although field studies have taught scientists many things about animal behavior, questions still remain. The study of these questions helps reveal the roles individuals play within a species, the niches a species fills in relation to other species, including humans, and even how humans behave and how their actions affect other species. For example, the apparent grieving rituals of elephants and the environment of mutual care in which they rear their young continue to fascinate many people, and the "self-sacrificing" behavior of bees and ants have contributed to the science of sociobiology. Field studies of animal behavior have the practical value of increasing researchers' understanding of how to conserve threatened and endangered species, as well as how to control pest species. English zoologist Jane Goodall is known for her work with chimpanzees in Tanzania, which began in 1960. Through her extensive fieldwork and detailed reports, she has greatly increased human understanding of primate behavior and has documented behaviors, such as tool use and warfare, which were previously believed to be unique to humans. Goodall's efforts have helped to prolong the survival of chimpanzees in the wild and have brought the issues of wildlife conservation to the attention of the world. Goodall, Jane. Through a Window: My Thirty Years with the Chimpanzees of Gombe. New York: Soko Publications Limited, 1990. Halliday, Tim, ed. Animal Behavior. Norman: University of Oklahoma Press, 1994. American biologist and psychologist who published over 250 papers and books. Nice was one of the first scientists to study the behavior of individual animals living in the wild, much as later biologists would study chimpanzees, gorillas, hyenas, and other species. In the late 1920s and early 1930s, Nice captured and marked individual song sparrows in her backyard, then studied them for their entire lives.